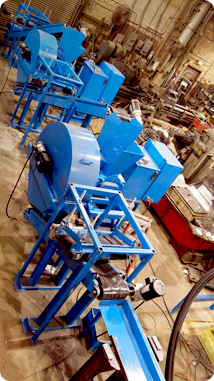 BCA Industries can provide turnkey systems for all sorts of recycling and separation requirements. 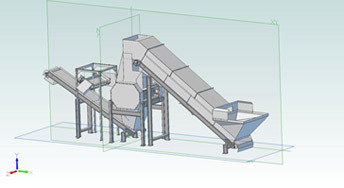 Shredders, granulators, conveyors, magnets, screening, density separation and manual pick lines. We start with a consultation of your specific needs. A general production map is created. Floor plan and power constraints are evaluated. 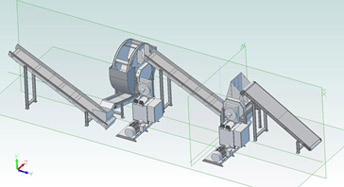 We then create a full 3D model using our state of the art CAD system of your custom system. Once every aspect is been approved all components are built and assembled here at BCA. All systems are fully assembled and tested for final approval prior to installation at your facility to ensure proper function prior to delivery. We provide installation, training and 7 day support on all systems we build. BCA can also retrofit equipment from other manufacturers, into our systems or add to your existing system. These are custom systems designed and developed for your needs, your business and your budget. Call us today and let us show you how to SHRED YOUR COSTS!